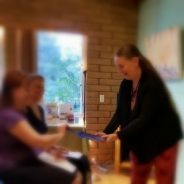 On Friday, June 23, 2017 I presented a class on Celebrating the Solstice/Sun with Tarot at the Songbird Community Healing Center in Cotati, CA. Here are some of the highlights, and the results of the one of the two group readings we did. When you add the digits of the year 2017 together, you get 10, corresponding to the Wheel of Fortune Major Arcana card in Tarot. When you add those digits together, you end up with 1: the symbol of unity and also the Magician card. I did a guest post on Songbird’s website explaining the resonance between the year and the cards. The Sun card, to me, is the ultimate Law of Attraction card. It’s about the Universe taking care of us and allowing us to shine. And, the readings we did supported that strongly. People in the audience picked a card for each position in each spread. Note that in the readings below, I used the Voyager deck, from James Wanless. The Spread: Choose 12 cards. You can place them in rows as we did, or in a circle, or in whatever shape you choose, as long as you know which month is which. 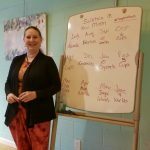 Here’s our results, and the energy for each month. It was pretty cool how the months really flowed into each other. The general theme was: expect the unexpected and be cool. July: 6 of Crystals [Confusion] – Confusion is the state of not-knowing (literally, against putting things together), so that new ideas can come in. If you find you don’t know or understand something, allow yourself to be in that state for a bit and see what happens. August: Fortune [Major Arcana] – Here’s the first card that resonates with the year and the Sun. Since you don’t know what’s going on in July, you might be able to spot a new opportunity when it comes around in August. Many people just let chances go, because…[fill in the blank here]. September: 10 of Worlds [Reward] – Another card that resonates with the year. And look what happens when you suspend your usual state of thinking you know everything (really…most sane people have this persistent illusion because it allows us to survive and keep going). Good stuff coming around, given that you’ve taken advantage of the opportunity of August. October: 6 of Cups [Sorrow] – One of the things that happens when we step into a new identity is that we don’t always honor what came before. You’re being invited here to notice that you’re now different than you were in July, and there are parts of yourself that have changed. November: 7 of Cups [Fear] – Oh boy! False Expectations Appearing Real, or my personal favorite as a Law of Attraction coach: Forgetting Everything’s All Right. November will challenge your ability to look through illusions, usually brought up by old emotional patterns, and see the Truth. December: Empress [Major Arcana] – Take care of yourself this month! The Empress has some issues with boundaries, so set yours appropriately as you celebrate the year-end holidays. January: 10 of Crystals [Delusion] – When you make your New Year’s resolutions, remember that they don’t exist until you make them real in the physical world. Notice where and when you’re fooling yourself about what you can or will do, and set yourself some supportive goals that you can get real about. February: 5 of Cups [Disappointment] – Expectations happen; again, it’s a human thing. February will be a month to consciously set those expectations and notice what comes of them. March: Child of Cups [Feeler] – Babies have feelings. They’re not shy about expressing them. People generally love being around babies because they get an excuse to smile, even beam, and get that smile reflected right back. On the other hand, everyone knows when a baby is unhappy. When and where do you express your feelings, honestly? April: Man of Worlds [Achiever] – Now you can get things in gear and go for it! You’ve made it through the confusion, taken the opportunity, sharpened your imagination, dealt with the path adjustments and the roller-coaster of emotions. Now, you can launch! May: Sage of Wands [Seer] – Keep your eye on the ball, or whatever you’re playing with. Stay clear in your vision of the outcome as well as the present. June: 4 of Worlds [Commencement] – I’ve nicknamed this card the “Nike” card – just do it! Nike is also the goddess of victory, so make it a win!